US Sen. Kirsten Gillibrand (D-NY) speaks to a large crowd at the state capitol for the third annual Women’s March on January 19, 2019, in Des Moines, Iowa. Kirsten Gillibrand is making a perhaps not-unwise bet in an era dominated by Democratic women: that her paid family leave proposal can distinguish her in a crowded 2020 Democratic field. Gillibrand, alongside Rep. Rosa DeLauro, has reintroduced the FAMILY Act, a plan that would guarantee new parents and other caregivers 12 weeks of paid leave. She’s been talking about this idea for more than five years, and it’s one that would be especially helpful for lower-income families, who often don’t have jobs with paid maternity leave. Economist Heather Boushey, a paid leave expert who served as a policy adviser for Hillary Clinton’s 2016 campaign, says the plan is a “big idea,” but the larger question is whether voters will treat it as one. During the 2016 campaign, paid family leave was a key plank of Clinton’s policy portfolio, but it wasn’t necessarily one of voters’ top issues. Of course, there’s always the problem of competing priorities. The national issue conversations in 2020 so far have focused on everything from reparations to Medicare-for-all — but it’s still early, and that could change. Gillibrand’s paid family leave plan would provide all workers the ability to take three months of paid leave whether they were a new parent, a caregiver for another family member, or ill themselves. It would pay out 66 percent of workers’ salaries, including at least $250 per month to each worker, capped at $4,000 per month per person. Gillibrand proposes paying for it with a 0.2 percent tax on each worker’s wages, which would be split between employers and employees. According to Gillibrand and DeLauro, that would amount to slightly under $4 a week in total for the average worker, a cost the senator has frequently compared to no more than a “cup of coffee.” Employers would split this $4 cost with the worker. The proposal has broad Democratic support: Gillibrand’s plan has since been backed by every other declared Democratic senator in the 2020 field, and was actually the bill that Bernie Sanders based his paid leave platform on in 2016. This widespread agreement is in contrast to the last election, when Hillary Clinton introduced a paid leave proposal that relied on a different payment mechanism: Unlike Gillibrand’s plan, which uses a payroll tax, Clinton’s was funded via a wealth tax. Although Clinton, at the time, lambasted the idea of adding more taxes on workers, the implementation of a payroll tax could have the upside of improving people’s buy-in to the program. “People feel like they have a stake in something they are paying into,” Boushey says. Republicans, meanwhile, are loath to add an additional tax burden for companies. As an alternative, Sens. Mike Lee (R-UT) and Joni Ernst (R-IA) have introduced an option that would provide up to three months of paid leave limited solely to new parents, which would be funded by dipping into individual Social Security benefits. This plan would delay employees’ Social Security benefits by up to six months per child, however, effectively forcing employees to choose between benefits they can use now versus ones they may need in the future. This plan, which is based heavily on a policy proposal form the Independent Women’s Forum, a conservative nonprofit, is designed to offer more flexibility for workers since only those who use the program would have to cover its cost, says IWF’s Hadley Heath Manning. “It’s completely voluntary. There’s no effect on people who don’t opt in,” she told Vox, amplifying a common conservative critique of paid family leave programs from those who don’t feel supporting families is a broader societal need but rather up to individual families to figure out. Manning also expressed concern at the cost of the FAMILY Act. Currently, the Family and Medical Leave Act, which became law in 1993, only goes so far as to guarantee workers three months of unpaid leave. Without a federal law establishing paid leave, only a small proportion of workers, 17 percent, have access to such benefits from their employers. That number goes down even further for low-wage workers, just 6 percent of whom have access to such programs, according to the advocacy group Paid Leave for the United States. As is frequently cited, the US is the only industrialized nation in the world that doesn’t have a federal paid leave program. Several states, including California, New Jersey, and Rhode Island, have already implemented a version of paid family leave, and the effects in these places hint at the potential impact of a larger federal program. In California — where caregivers can apply for up to six weeks of paid leave — the implementation of the program, which went into effect in 2004, has increased the rate at which men and women take leave and improved children’s health outcomes. Paid leave programs have also been found to increase worker retention rates in low-wage jobs, and reduce new parents’ use of public assistance. One key difference between the California program and the federal one proposed by Gillibrand is that the state’s program is paid in full by an employee tax and does not add an additional cost for the employer. The family leave offerings in New Jersey and New York are also covered by the employee, though the states’ disability insurance programs include payments from employers. There are some key caveats that come with the possible implementation of a federal paid leave program including the concern that it could actually widen the gender wage gap. As a 2013 Pew Research study noted when evaluating paid family leave across different countries, countries that have more weeks of paid parental leave also happen to have wider gender wage gaps, potentially because women are more likely to take advantage of the leave. Employers could also discriminate against women workers under the assumption that they would be more likely to use leave benefits. To counteract this effect, places like Iceland have instituted “use it or lose it” paternity leave, which has helped increase the number of fathers who capitalize on the benefit. Under this policy, both parents are allocated a set amount of leave that’s non-transferable. If fathers don’t take advantage of their dedicated paternity leave, it effectively goes to waste. “If you look at places that have more generous paid family leave programs, they have higher gender wage gaps,” says IWF’s Heath Manning. “They encourage discrimination against women when it comes to hiring.” By adjusting the way leave benefits are structured, it’s possible the U.S. could factor this imbalance in as well. Questions have also been raised about the cost a smaller business would incur from establishing family leave programs. While many companies that already employ such programs have noted that it increases employee retention, covering potential worker absences would be an additional cost when workers take leave, writes Harry Holzer for Brookings. Companies may pass on this cost — along with the added payroll tax they would need to pay — to workers in the form of lower wages. Advocates for paid leave benefits note that companies save money on reduced turnover in the wake of a program’s implementation and that these savings help neutralize potential costs. According to a 2016 study from economists Kelly Bedard and Maya Rossin-Slater, the majority of California employers did not detect any cost losses in the wake of the implementation of the program. Companies that have implemented paid leave programs on their own have seen wins as well when it comes to holding on to talent. In 2007, Google began offering new parents 18 weeks of paid leave instead of 12 weeks, and it was able to curb the attrition of new-mom employees by 50 percent as a result. Another issue a paid leave program will need to address is whether it serves as a benefit even for workers who may not use it. Unlike Social Security and Medicare, paid family leave may be a program that’s only relevant for a portion of all Americans, even though everyone will be paying into it. Because of how broad the benefit provided by the FAMILY Act is, however, lawmakers argue that workers can use it in various situations, including instances when they are ill themselves. Finally, the length of paid family leave is also a key factor in how successful that policy could be. As the Gates Foundation discovered, a one-year paid leave offering ultimately proved too burdensome for the organization to sustain and made it tough for work to be effectively continued uninterrupted. Three months is still widely viewed as potentially too short and not enough time for parents to properly recover and build their relationship with their child, the New York Times’s Claire Caine Miller reports. Researchers have signaled that six months could be closer to the ideal time frame for both workers and companies, because longer paid leave programs have also been observed to have negative effects on women’s likelihood to return to work. Gillibrand wants to make paid leave her signature issue — but will it be enough? Gillibrand has made it clear she intends to focus on the power of women and families as a central component of her campaign. Whether this approach resonates with voters, and fuels a larger discussion among 2020 candidates, remains to be seen. 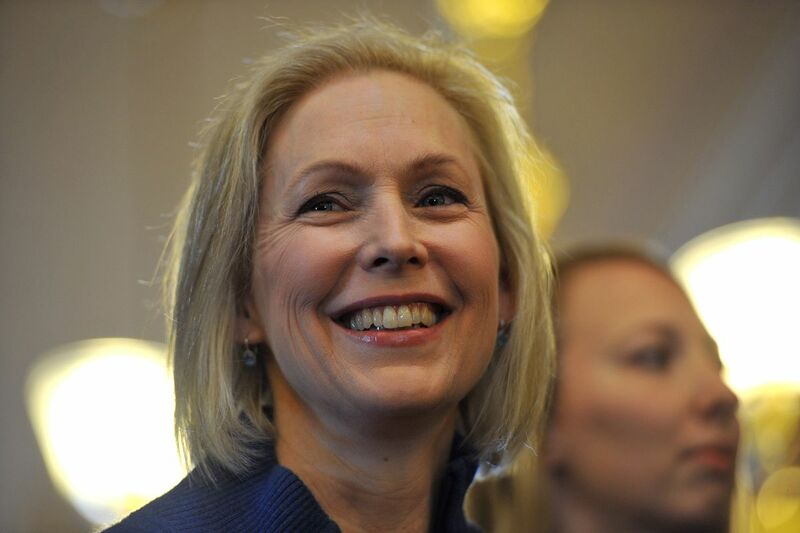 As of a weekly Morning Consult poll conducted in March, Gillibrand was trailing the current frontrunner and garnering just 1 percent of voter support. Family leave — which Clinton, Sanders, and Trump all addressed in 2016 — has evolved from a peripheral topic to a central one as more candidates raised the issue during the 2018 midterms. In addition to being a policy Gillibrand can highlight on the campaign trail, it’s also one that’s widely welcomed by the broader American electorate, with 84 percent of Americans across both parties supporting a federal paid family leave program, according to a recent survey from the National Partnership for Women and Families. Given the overwhelming support for a paid leave program, it could even be a motivating topic for voters as they try to decide among an incredibly crowded Democratic field. “Paid leave is a very powerful issue for voters. It taps into economics, equity, and family. It can help reinforce [Gillibrand’s] family theme. It helps mobilize and persuade women,” says Democratic pollster Celinda Lake. Correction: This piece previously listed the payroll tax as 0.002 percent. It is 0.2 percent. Beto O’Rourke’s border cred is genuine. It’s not the same as an immigration platform.